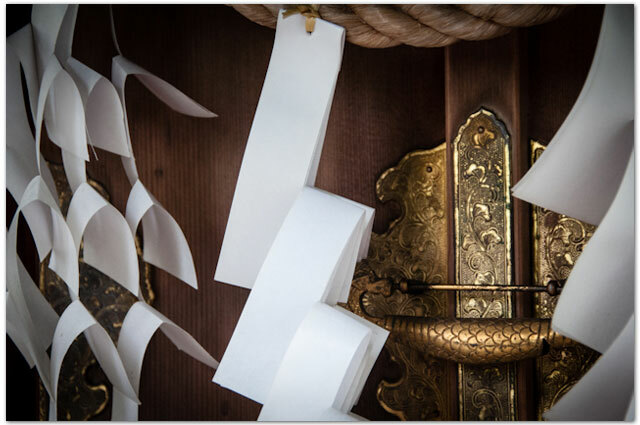 In noh, a traveler on a journey arrives, often in a famous place. Most times they meet with a local person, and ask “What can you tell me about what happened here?” The person from the area replies “Well, I don’t really know so much about such things,” but then proceeds to tell them all about it. In my journey through Japan, I am inherently the traveler. Every place I’ve visited has a story, and everyone I’ve met has answered my questions with kindness and generosity. The Sasaki workshop artisans [ 佐々木能衣装 ] were patient with our questions. How many miles of silk thread? How many dyed colors? How many paths in the thread? Finite answers, certainly, but numbers larger than my mind readily allowed for. For myself, another confrontation with the details. The rafters, stacked with newspaper-bound Jacquard cards to feed through the counter-weighted drop pins on the looms. The walls lined with thread. The floor bare wood, polished with the sheen of finite but countless feet. 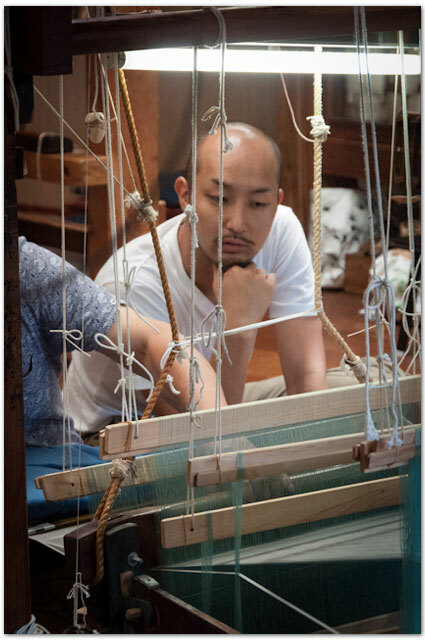 That afternoon, Kensuke Tsutsui was having a problem with his loom. The piece he was working on had just been started, and involved a crossed weave; one where the warp was pulled first one direction and then the next while the weft wound through the interlock. The intended result was gauzy sort of transparency, but stiff almost, with crinoline-like feel to my inexperienced hands. 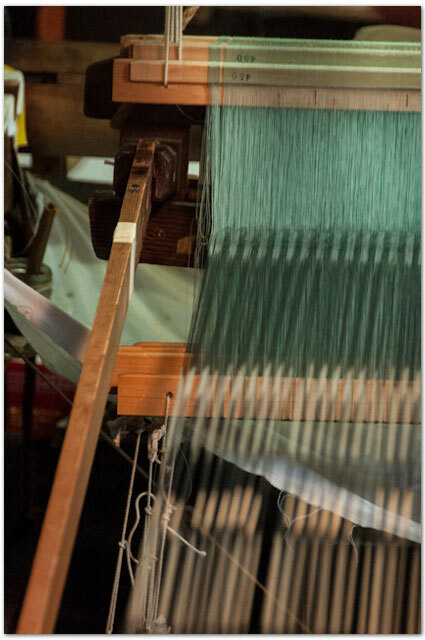 The weaving style for this new cloth was placing an incredible amount of tension on the warp, and something wasn’t quite right with heddle adjustment. Through the narrow shed, the thread alignment of the weft was incorrect. Conversation ensued, adjustments made, hammers deployed. When I met with Tsutsui-sama later that day and asked 「大丈夫か？」he replied 「はい、大丈夫でした。」(“Is it all right?” “Yes. It was all right.”) He had examined the thread, found the problem, adjusted the loom and proceeded with the cloth. I’ve been considering the many paths that have led me to these moments. The intersection of my path with our instructor Monica Bethe’s, with master artisan Kensuke Tsutsui’s, with my fellow students. 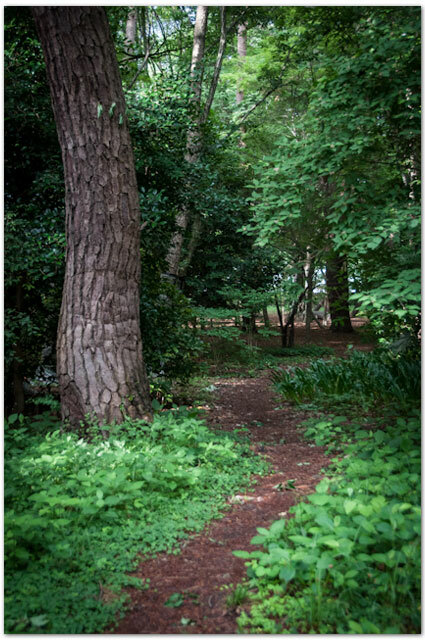 Standing in the dark wood of Sasaki’s I knew that the warp threads that were the paths of my life had started somewhere, would wind up somewhere else, and that the wefts that intersected had also been wound from skein to spindle to bobbin. Maybe there’d been a problem with my loom, perhaps the tension too great, and the twists too numerous. Finite answers certainly, but numbers far to large for me. Perhaps someone from the area might arrive, and with kindness and generosity tell me the story of the place. This entry was posted in Workshops, Writer's Workshop and tagged 2014 costume workshop, examining details, heddle, jacquard, kensuke tsutsui, monica bethe, plain weave, sasaki noh robe, silk thread, theatre nohgkau, weaving details, 大丈夫, 佐々木能衣装. Bookmark the permalink.